Stars are big news this season.I found these beautiful 8mm metal star charms a few months back on a trip to London and have wanted to use them and now I finally can. 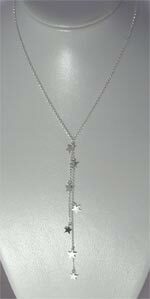 This elegant necklace is perfect for day wear and can even take your outfit into the evening.Hanging from the 16" sterling silver chain is a 5" drop gently sprinkled with a few of the beautiful star charms.As you can see these charms really capture the light looking as though the shimmer from dark to light. This is a simple and stylish necklace which can accompany so many outfits.